Aiseesoft iRiver Converter Suite is the most valuable iRiver Converter that includes two excellent iRiver Converters: Aiseesoft DVD to iRiver Converter and Aiseesoft iRiver Video Converter, so it is an all-in-one and easy-to-use iRiver conversion solution. It can efficiently convert DVD and any video to WMV, WMA, MP3, OGG for all your popular iRiver players such as iRiver Mplayer, Volcano, T series, E series and PMP series. Aiseesoft iRiver Converter Suite can also convert audio files including MP3, MP2, AAC, AC3, WAV, MID, MIDI, WMA, M4A, RA, RAM to MP3, WMA audio formats. This powerful iRiver Converter Suite gives you a free hand to customize the output file, such as movie joining, movie cutting and movie cropping. It also has more parameters of video and audio bitrate, resolution, frame rate for you to set according to your need. The audio track and subtitle are also available for you to choose the condition to meet your personal need. 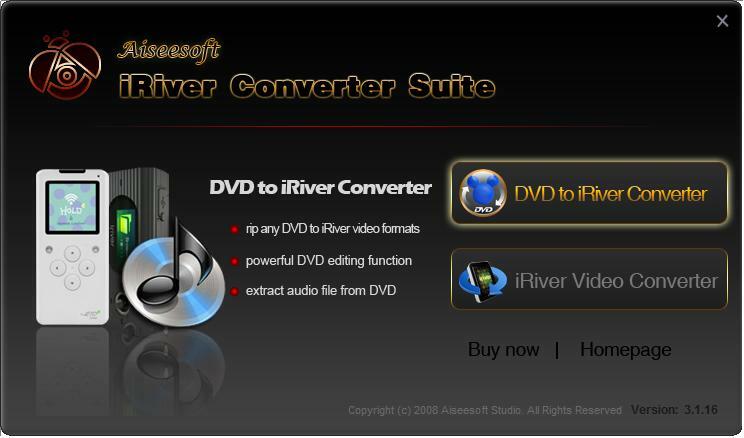 Aiseesoft iRiver Converter Suite could perfectly convert DVD to WMV, WMA, MP3, OGG and any video such as MPG, MPEG, MPEG2, VOB, MP4, M4V, RM, RMVB, WMV, ASF, MKV, TS, MPV, AVI, 3GP,3G2, FLV, MPV, MOD, TOD to WMV video formats with high speed and excellent image quality. Convert DVD to iRiver WMV and iRiver audio formats including MP3, WMA and OGG. Qweas is providing links to Aiseesoft iRiver Converter Suite 4.0.06 as a courtesy, and makes no representations regarding Aiseesoft iRiver Converter Suite or any other applications or any information related thereto. Any questions, complaints or claims regarding this application Aiseesoft iRiver Converter Suite 4.0.06 must be directed to the appropriate software vendor. You may click the publisher link of Aiseesoft iRiver Converter Suite on the top of this page to get more details about the vendor.